General Characteristics: Medium in height, well spreading, stocky, maturing within 9 to 12 months, producing from 5 to 10 oha; distinguished by its deep reddish-brown petioles and white base. Petiole: 65 to 80 cm. long, deep reddish-brown slightly diffused with green, purplish-red at apex, white at base, with a narrow, dark pinkish edge. Leaf blade: 40 to 55 cm. long, 25 to 35 cm. wide, 30 to 45 cm. from tip to base of sinus, sagittate, dark green with bluish cast; piko large, conspicuous, purple; veins distinctly purplish-red on lower surface, usually purplish on upper; lobes acute with narrow sinus. Corm: Flesh chalky white with yellow fibers; skin white to cream-colored. 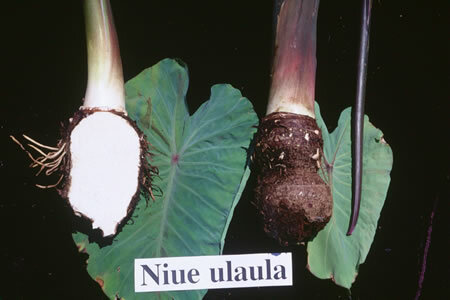 Origin, and derivation of name: Introduced from South Seas by Wilder as one of two distinct forms named Niue; The suffix ulaula has been added to designate the reddish hue of the petioles. Use: Principally as a table taro. Remarks: According to Christophersen (2), Niue is apparently the name for a group comprising at least three varieties; the writers have not, however, been able to ascertain any characters by which the members of the group are linked.